Save up to £20pp when booking tickets in advance with Alton Towers with tickets priced from just £33 an adult & £27.50 a child. Booking online also allows you to bypass the queues at the ticket queues which works well under our Tips To Beat the Queues at this popular visitor attraction. We tend to find that those that can plan ahead can gain the best savings off standard price tickets. Each year Alton Towers teams up with The Sun to offer readers a chance to pick up 2 FREE tickets to Alton Towers! Whilst this is quite a complicated deal, simply follow the instructions to the letter to enjoy complimentary entry to the park, rides & attractions. This free ticket offer is particularly beneficial for those with flexibility on when they visit Alton Towers as you cannot select the actual date of your visit. This free ticket offer will up & running shortly so we’ll bring you more details as they come in. LOOK OUT FOR OUR Alton Towers Guide packed with tips & tricks to beat the queues plus money saving ideas to get the best from your day. We’ve put together a full list of 2 for 1 vouchers for Alton Towers that helps you save time & money. Remember that 2 for 1 voucher holders must be accompanied by a person paying the full on-the-gate ticket price on the day of your visit and cannot be used in conjunction with online ticket discounts or any other deal or discount. More information available at Alton Towers 2 for 1 Vouchers. Regular Tesco spenders can use clubcard vouchers to slash entry costs at Alton Towers. You have the choice of a one day Alton Towers ticket or a Merlin Annual Pass with these ‘pay in full’ deals. Simply redeem your vouchers prior to your visit and present to the ticket kiosk on the day of your visit. You can even upgrade to a Premium Merlin Pass for around an additional £50pp cash when you visit the park. Extend your break at Alton Towers with an overnight stay either at one of the on-site resort hotels or accomodation located close-by. The great advantage is that these breaks come with a FREE second day at the park. Opt to stay on site & you can also pick up Early Ride Time that offers you 30 minute early access onto select rides & attractions before the park opens to the public! Resort accommodation includes the Splash Landings Hotel & Waterpark, Alton Towers Hotel & Spa or Enchanted Village Lodges that all come with a free parking perk too. Promotions vary throughout the season including Kids Go Free offers that offer value for money. 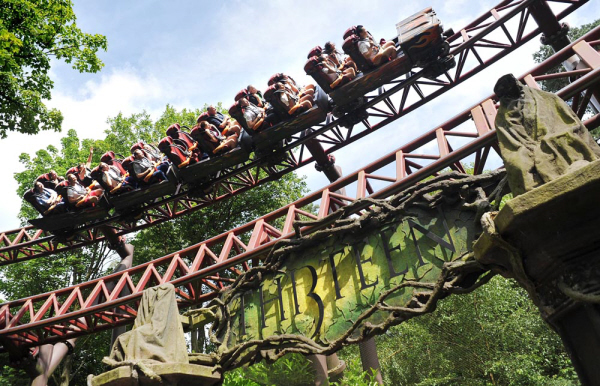 Save more than £20pp if you book online directly with Alton Towers 5+ days in advance. Tickets are priced from £33pp, (£27.50 a child) and includes entry to the park, all the theme park rides & attractions including NEW Wicker Man & CBeebies Land. Ticket prices vary throughout the season but we tend to find the best prices are reserved for those that book ahead. Alton Towers teams up with Kellogg’s to offer a popular 2 for 1 voucher that is valid at many Merlin Attractions. Whilst vouchers can only be used in conjunction with FULL PRICE on-the-gate price tickets, these vouchers can been redeemed online in advance through a special booking site. More information is available at Alton Towers – Grown Ups Go Free Vouchers. 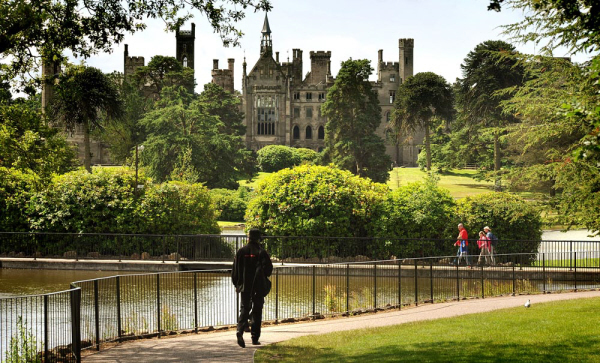 Look out for attractive return visit offers to Alton Towers that run throughout the year. These can offer value for money with options on next day entry as well as later in the season tickets. We’ve even come across a deal for the Alton Towers Waterpark! It is important that these deals that you purchase your come back ticket BEFORE you leave the park on your initial visit from the resort box office. More details available at Come Back Tickets for Alton Towers. Consider a Thrill Hopper ticket that offers you one admission to all four of the following; Alton Towers, Drayton Manor Theme Park, Water World & Snowdome, (limited to specific activities). This combi ticket offers substantial savings against the cost of four separate 1 day entries with Thrill Hopper tickets priced at £60pp or £180 for a family of 4. More information available at Thrill Hopper Ticket. Half price ticket vouchers from Carex remain valid for use at Alton Towers until 31 May 2018. For those that managed to pick up these promotional vouchers last year, here’s a chance to enjoy half price entry to the park. This voucher is particularly useful for groups that have an odd number in their party that can be used against full price on-the-gate price tickets. More information is available at Carex Half Price Alton Towers Vouchers. The Kids Go Free vouchers from promotional Vileda cleaning products remain valid at Alton Towers until 29 March 2018, (during attraction operating hours). Whilst there is only a limited window available for this offer, you can find more details over at Vileda Kids Go Free Vouchers; Alton Towers, Sea Life, Legoland Discovery Centre. Look out for NEW wooden coaster opening at Alton Towers in 2018 The Wicker Man complete with a 57.5ft, (17.5m) flaming structure! Claiming a world’s first by combining wood and fire within a coaster, this £16 million ride is likely to be popular with theme park visitors this year. This entry was posted on Monday, January 1st, 2018 at 1:04 pm	and is filed under Alton Towers, Staffordshire. You can follow any responses to this entry through the RSS 2.0 feed. You can leave a response, or trackback from your own site. If I have a bogof ticket can I up grade to use in the park a second day ? Hi Donna, you can only use a 2 for 1 voucher against one day entry into the park. The voucher holder gains free entry when accompanied by someone paying the full on-the-gate price ticket and cannot be used in conjunction with any other offer. However once in the park you can purchase discounted second day tickets from the ticket box office before you leave. These second day tickets are valid even if you entered Alton Towers with a 2 for 1 voucher on the first day but must be purchased before you leave the park on the initial day. Hi Mary, the come back tickets are still running at Alton Towers during the 2016 season where you can pick up next day tickets for just £10pp or later in the season tickets for £15pp, (some exclusions on dates). These come back deals are available to those that use a 2 for 1 voucher on the day of their initial visit but you must keep hold of your first day theme park tickets and present at the resort box office BEFORE you leave the park on the first day. Hi, do you have any 2 for 1 vouchers for Alton Towers please? Hi Caitlin, you can pick up 2 for 1 vouchers for Alton Towers on promotional packets of Kellogg’s cereals that can either be presented on the day at the ticket kiosk or redeemed online when you prepay for a full price adult ticket. More details available at 2 for 1 voucher for Alton Towers from Kellogg’s Cereals. Hi i am trying to take some of my day service users to Alton towers we are trying to take about 22 people for a day trip and can be a expensive day do you know if there is any special deals that we will help bring the price down hope you can help thank you. Hi Darren, worth looking at group discounts at Alton Towers. Discounted tickets are available for groups of 7 or more with additional discounts in place for groups of 10+. You can also find more information about other youth group offers, (I wasn’t sure whether your day service users fall into this category) with free leader places. Hi Alexandra, yes Kellogg’s are doing a new 2 for 1 voucher this year that includes Alton Towers. Look out for promotional packets where you will find the voucher on the side of the packet. Do you know where I can find last minute 2 for 1 vouchers? Hi Becky, try promotional packets for frozen Birds Eye products that are offering 2 for 1 vouchers. Some supermarkets are still selling promotional packets of Kellogg’s items that run with an Adult Go Free voucher. Worth checking if The Sun is still running 2 for 1 vouchers for Merlin Attractions including Alton Towers. Hi me and my friends are wanting to go to alton towers on the 24th oct which is saturday can we use the newspaper 2 for 1 vouchers during the scarefest period. Ho Lois, unfortunately I do not have any details regarding the newspaper offer that you are looking to use. I can only refer you to the terms & conditions, (that will either be on the actual voucher or they will refer to a website with the full terms & conditions), that will state any excluded dates. I was wondering if you can use the Kellogg’s vouchers to get into Alton towers for the fireworks in November? Have been seeing conflicting answers about this. Hi Alisha, last year the Kellogg’s Adults Go Free voucher explicitly excluded the firework events at Alton Towers, (8 & 9 Nov 2014). The 2015 Kellogg’s Adults Go Free voucher does not mention within the terms & conditions any excluded dates for Alton Towers around the fireworks, (only during Feb 2015). Whilst there is a general exclusion on any ‘secondary ticketed events/hotel events/concerts at all attractions’ my understanding is that the Alton Towers fireworks does not fall into this category, (although subject to capacity limitations at the park). can you use the 2 for 1 or half price from the crisp packets or cereal boxes during scare fest or would it be cheeper just to book online in advance? Hi Hazel, my understanding is that you can use Kellogg’s adults go free vouchers/Birds Eye Kids Go Free vouchers over Scarefest at Alton Towers but it is subject to capacity limitations within the park. We are staying for 2 nights at the enchanted lodge in October, extra celebration for a joint 50th birthday weekend! We have got our waterpark tickets already with the booking. We are 2 adults and 3 x 12 year olds. I have 2 for 1 Kelloggs VOUCHERS. plus 1 x free with tesco tokens, or 3 x tesco token plus 20.99 each cash top up. Will we have to split up to enter, ie 1 x adult with the 2 girls and 1 x adult with 1 x girls with the free sun vouchers ? or can we all just go in together, seems confusing as I can’t send 1 x 12 year old in on her own with the free tesco voucher ?? Hi Alison, within the terms & conditions of the free tickets to Alton Towers in The Sun it states that ‘Any further additional visitors accompanying offer ticket holders must pay the full admission price at any admission kiosk at the park’. Similarly 2 for 1 vouchers also state that they cannot be used in conjunction with any other offer, (for the 2 for 1 voucher, you will need someone to pay the full on-the-gate price ticket). However in practice, if the ticket kiosk staff insist, simply split up into smaller groups at the kiosk but hopefully you won’t need to do this. Will probably split up at the kiosk to avoid any hassle, or pay a bit more and buy the 3 x tesco on the top up offer. Therefore we have already paid and have tickets, so no queue as such ! Probably well worth it for just £10 more !! Hello, we’ve got a couple of Kellogg’s vouchers off of the Squares Bars, and we’re in the area for the bank holiday weekend, and potentially go for the one or even 2 days (I understand they can only be used for the one day). I have checked on the T&C’s of the website and it doesn’t say anything about not being able to use them for the bank holiday weekend, but I’m just checking I haven’t missed anything and that they can be used? Hi there im Hoping to go to alton towers on the 3rd of september for the day we are 2 adults, what would be best way to go about this? Hi Ollie, you could take advantage of the Kellogg’s Adults Go Free voucher that offers 1 free adult when accompanied by a full paying adult or child paying the full on the gate price. Alternatively check out the online prices if you book directly with Alton Towers and these also come with Early Ride Time too. hiya. am wanting to bring a 2 year old to Alton towers, purely for cbbs land. It will include 3 adults. Could you tell me the best way to do this please, and any promotions we can do and where to find them please. Would have to be discounts we can use on a bank holiday.. Thank you in advance. Hi Sarah, under 4’s go free at Alton Towers. 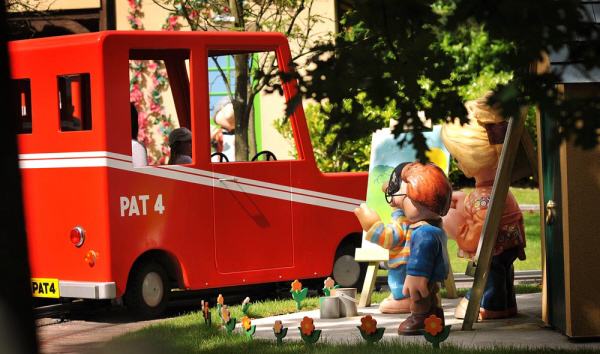 Cbeebies Land is located within the Alton Towers Theme Park and so you will need to entrance tickets to the theme park for the rest of your party. You could make use of the Kellogg’s Adults Go Free vouchers that are valid at Alton Towers during the summer that offers 1 adult free entry when accompanied by a full paying adult or child paying the on-the-gate price ticket. Alternatively, you could make use of the current £27pp Groupon offer for Alton Towers that is valid until 26 August. Worth checking out the online ticket prices at Alton Towers too. Hi! It is my sons birthday and he would like to visit Alton Towers…do you have any discounts or 2 for 1 offers during July please? Thank you. Hi, with the 2 for 1 offer does the non paying person still get the second day cheaper? Me and my friend are planning on going to alton towers on tuesday the 9th of june. Was just wondering if the cheapest option for us is to use is the Kelloggs 241 deal when we are at the door? Hi, a 2 for 1 voucher requires one of you to pay the full on-the-gate priced ticket and generally tends to offer the greatest savings. However if you purchase online, you can pick up online discounts, (currently up to 25% off although this can change during the season), with the added benefit of Early Ride Time that offers you the chance to enjoy select rides at the park before the park opens to the public. Hi, as you probably be aware children under 4 years go free at Alton Towers. Unfortunately, Alton Towers policy is that all adults, (& children 4 years and above), need to pay entrance charges whether they intend to make use of the rides or not. As you say, the £24 off Alton Towers entry that ran on promotional packets of Procter & Gamble items, is valid until 1 June 2015. Within the terms & conditions it states that the ‘Voucher is valid until 01.06.15 at the Alton Towers Resort excluding Theme Park closed dates (10.11.14-13.02.15 and 23.02.15-20.03.15). Dates subject to change–check opening dates & times before your visit at altontowers.com’ There is no mention of bank holiday exclusions. Hi, me and my partner want to go to Alton Towers tomorrow 22nd April. Where can I find the 241 deals please? Hi Jody, you can pick up adults go free vouchers for Alton Towers on promotional packets of Kellogg’s cereals & breakfast bars that are widely available. Each voucher will provide an adult free entry when accompanied by a full paying adult or child paying the on-the-gate price ticket. Hi Richard, Cbeebies Land is located with the Alton Towers theme park so you will need to purchase tickets for the full theme park and this will include entry to the Cbeebies Land area of the park. As children under 4 years go free at Alton Towers, you will need to purchase tickets for 2 adults & 1 child. You could take advantage of one 2 for 1 voucher, (check for any exclusions on use), or consider online savings if you book in advance. You can also check out other cheap ticket options for Alton Towers as set out within our Alton Towers deals page. Hi Louise, unfortunately I don’t have any vouchers to give but you can easily pick up some Adults Go Free vouchers that are valid Alton Towers on promotional packets of Kellogg’s cereals & breakfast bars that are widely available. What shops n products have the 241 vouchers? Hi Alex, you can find adults go free vouchers for Alton Towers on promotional packets of Kellogg’s cereals including Crunchy Nut, Frosties, Raisin Wheats, Fruit Loops, Rice Krispies, Ricicles, Honey Loops plus a range of breakfast bars too. These products are widely available in supermarkets that sell branded items. Hi I was thinking of coming on the service day on the 15th March, can you tell me if all of the rides will be open please? And am I able to take 4 other people with me? Hi Vicky, we’re hearing reports that this Armed Forces day in March is sold out. Perhaps best contacting Alton Towers directly on the number given to check availability – be great if you could let us know whether there are tickets still available so we can pass it on to our readers. Hi Lynne, whilst under 4’s are free at Alton Towers, there is a small charge in place at Drayton Manor for children age 2 -3 years of around £5. There are also charges in place at Water World & at the SnowDome that you would incur for 2 year old so you would best placed to purchase the family Thrill Hopper that offers entry to 2 adults & 2 children, (under 12 years). You will need to select a particular activity at the SnowDome, some of which are age-specific. Yes, you can use the thrill hopper ticket during the theme park season including the summer holidays, (excluding bank holiday weekends & special events such as fireworks & concerts). Hi Gina, thank you for your query regarding Alton Towers. Topdogdays is independent of Alton Towers, (we simply let you know of deals & discounts for top UK visitor attractions), so you are best contacting the Alton Towers Hotel directly to discuss availability. In previous years, Alton Towers required guests with a disability to pay full price at the park but were eligible for 1 free carer if they required support, (documentary proof of disability will be required). Me and my brother is planning for alton tower on coming monday but i cant find any good deal :(! Hi Anjali, unfortunately Alton Towers theme park is currently closed. Alton Towers re-opens for a week over February Half Term, (14 – 22 Feb 2015) & then the main theme park season begins on 21 March 2015. There are six of us going on Saturday I wanted to use the 2 for 1 voucher but it’s been taken off hot uk deals, do you know where I could print the vouchers off ? 2 adults and 1 child would like to go on Sat 1 Nov 2014 and I wondered what the cheapest way of doing this would be, I do have a 2-4-1 ticket from the SUN in Oct but unsure if valid for Scarefest and also could I use a walkers 1/2 price offer for my child. Hi Kelly, the October 2 for 1 voucher in The Sun is valid at Alton Towers until 7 November and allows one free entry per full paying ADULT. Only one voucher can be used per person & per transaction so you may have to split into a 2 and a 1 to use both vouchers, (the Walkers half price voucher is valid at Alton Towers on 1 November & can be used for 1 adult or child). 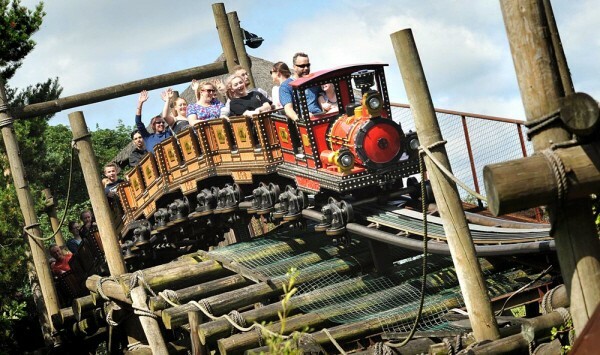 A child at Alton Towers is under 11 years with under 4’s free of charge. Be aware that vouchers do not guarantee entry if capacity is reached at the park on the day of your visit. 1 tickets (to use on the Friday and Saturday) or to use the online discount as it is 6 pound extra per person for a second day? Hi Jan, I suppose it comes down to the savings you can make with each options. You could pick up an online discounts if you book online and take advantage of the return ticket offer that comes with this. Alternatively you could use a valid 2 for 1 voucher for the initial day and then pay for a come back ticket at the resort box office on the day that are priced at £9.60pp. More details available at Come Back Tickets for Alton Towers. Hi do you know of any current 2 for 1 vouchers available for the firewroks on 8th November? Hi Sophie, I know both the Walkers half price vouchers & Kelloggs Grown Ups Go Free voucher are NOT valid on 8 & 9 November, (although you could use them on 7 November). Unfortunately I can’t think of any vouchers that are valid on 8 November although be interesting to see if any late 2 for 1 vouchers emerge in the coming weeks. Hi, the terms & conditions of this offer state that ‘only one voucher can be used per person & per transaction’ so you may have to pay individually at the ticket booths. Hi Danny, with these half price Procter & Gamble vouchers the voucher entitles an adult to half price entry to Alton Towers. An adult at Alton Towers is deemed 12 years and over, (under 4’s go free). Only one voucher can be used per person and per transaction and cannot be used in conjunction with any other offer, concession, online tickets or reward/loyalty programme. If you have children age between 4 & 11 years, you might want to consider either the Walkers half price vouchers that are valid for adults or children or the Kelloggs Grown Ups Go Free vouchers. Hi Jodie, the Walkers voucher is valid at Alton Towers on 14 September & offers you a half price ticket off on-the-gate prices. You can gain a discount if you book online but the savings will be less than those you will receive with a half price voucher. Remember only one voucher can be used per person & per transaction so ensure you have enough vouchers for your party. hi, can you use the 2 for 1/ half price entry tickets during scarefest? Each 2 for 1 voucher for Alton Towers have slightly differing terms & conditions so best check the fine print for exclusion dates. I am aware that the Kelloggs Grown Ups Go Free vouchers & the Walkers half price vouchers are both valid for Alton Towers Scarefest but not valid on 8 & 9 November 2014. Can I use the Kellogg’s 1 free adult ticket, if paying full price on child’s ticket, on Friday 15th August 2014. Hi, we want to go to Alton Towers tomorrow, Saturday, and we do not know if we can use the water bottles tickets to get a 50% discount. Is it ok? can we use it and buy the tickets directly at the theme park? Many thanks. Hi Celia, I am not aware of the full terms & conditions for this offer…just double check what exclusion dates there are on this offer. Generally valid vouchers must be presented at the ticket booths on the day of entry at Alton Towers to secure the stipulated discount. ok. Many thanks for your help. Hi..I have two £24.00 tickets . for Alton Towers From Daz. I am intending to take four adults and one under twelve.. One adult is disabled of whom I am the carer..How much would the cost be for entry.. ? ..And is it cheaper to use one half price offer. Or .? Yes I am confused. ? Please help to give me a costing.! Hi Anne, I can see on the Alton Towers website that it states’A disabled guest pays the standard price and is eligible to one free carer (proof of disability will be requested).’ What is less clear is whether the disabled guest can take advantage of a half price entry voucher and still pick up free entry for the carer…you are probably best contacting Alton Towers directly to discuss the best way forward in this instance. Hi Pam, yes you can use your Kelloggs Grown Ups Go Free Voucher at Alton Towers on 9 August. If you are using vouchers, you cannot book online but will need to present the voucher to the ticket kiosk staff on the day of your visit. To secure free entry you will need to be accompanied by a full paying adult or child paying the full on-the-gate ticket price. Hi Leigh, from the Alton Towers site it states that ‘a disabled guest pays the standard price and is eligible for one free carer, (proof of disability will be requested).’ I can’t see any specific deals for 2 day tickets for those with a disability although there is of course the comeback ticket offer that you could take advantage of. Moe details available at Come Back Ticket Offers for Alton Towers. Hi we are planning to go to Alton this weekend, can we use the Kellogg’s coupons in water park too? Hi Jom, unfortunately you cannot use the Kelloggs vouchers at the Alton Towers Waterpark only the theme park. However, if you are looking to visit both the theme park & the waterpark, it could be worth looking at comeback ticket offers for the waterpark. More details available at Comeback Deals for Alton Towers. Hi Paul, I know what you mean as there are so many deals out there for Alton Towers it can be hard to work out the best price for a short break. Unfortunately, the only way through is to review all the available options for the dates you can make. There are packages available that combine Alton Towers tickets & accommodation or just accommodation offers that allow you to then take advantage of 2 for 1 vouchers or other discounted ticket offers. My understanding is that the themed rooms do come at a premium so if you are looking to keep the costs down then perhaps consider standard rooms or those off resort. Hello , im thinking to buy alton tower vouchers from ebay , and go to it on this saturday with my gf , so if i pay for a ticket she goes free? and we can use all scary rides ? Hi Karen, unfortunately at Alton Towers everyone has to be pay admission charges whether they intend to make use of the rides/attractions or not. Blackpool Pleasure Beach has a different system that allows entry to the park for around £6 for those not looking to access the rides if that is of any use to you? I have Kellogg’s Free adult entry , if I pick alton towers can I enter to CBeebies land as well ?? hi i have some grown ups go free vouchers and was wanting to use them at either alton towers, chessington, lego land, or thorpe park – but on alton towers website it says that they are only valid until the 31st may 2014 – but cant find any info on valid dates on the other websites. Can anyone help please? Hi Stacey, there are 2 Kelloggs Grown Ups Go Free vouchers currently running…one expires 31 July 2014, the other 30 June 2015. Have a look at the small print on the actual voucher that will give you the expiry date but remember there are some exclusions for use at the attractions to take account of. i have been in contact with kelloggs this morning, and informed them that on the alton towers website it states that the offer ends on the 31st may 2014. And they are looking into it and going to give me a call back. As they have said they wasnt aware of this and that alton towers can have their own exclusion dates but cant actually have their own terms and conditions on the offer, and shouldnt be able to end the offer early – so shall keep you informed on what they come back with. Hi Stacey, there are quite a number of 2 for 1 vouchers/grown ups go free promotions currently available, each has slightly different terms & conditions including different expiry dates. Best to check the expiry date written on your specific voucher & remember to check for any exemption dates. hi, can i use 2 for 1 vouchers to enter cbeebies land aswell as alton towers or is there a extra charge for cbeebies land? Hi Gemma, yes the 2 for 1 vouchers or Grown Ups Go Free vouchers will get you into CBeebies Land too when it opens to public as there is no additional charge for these attractions. Hi Bridget, which Merlin Attraction are you looking to visit on 13 May? 2 for 1 vouchers for the 2012 season tend to start coming out around March time. The Kellogg’s 2 for 1 vouchers remain valid until June 2012 if you have managed to pick those up at all.